Comics Make Me Happy! : The Fine Line Between Homage and "Just Plain Ripping Off"
"Ripping off" from fine art would only bother me if a.) the intended audience thought it was the comic artist's original idea, and b.) if an idea was overused. 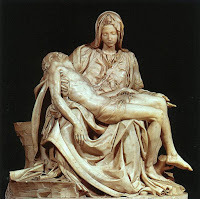 The author of the article left out a glaring admission (perhaps becuase his list skewed Marvel): The Pietá. While not fine art (it's sculpture, but it's still classic art.) 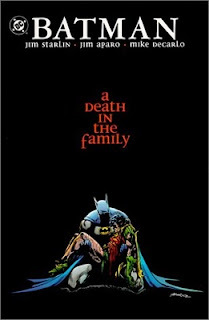 And it's been referenced inside comics more than on covers. But it's been done a lot. Pretty much any time someone dies in the DC Unviverse, except Barry Allen. Can you think of any other references? The Captain Marvel one is really the closest. I'm surprised ComicVine didn't mention any of those examples. Thanks for your comments, Tom. Good to see you here! Greetings, It's the "Ever-creative One True GL" (Yup, I read all your posts and I really should have your praise framed somewhere). I loving your blog - It's very much you. I don't have a specific example (as comic and issue, but whenever a flying hero is struck with a power bolt/ray of energy, the resulting image often resembles paintings of fallen angels. GL Bizzaro....I'm trying to imagine that. If it's Bizzaro Hal, I bet he's very competent, completely bald, has a wife, three kids and a dog, and has never gotten hit in the head, ever.